My great uncle (or is it great great uncle), Conrado Marrero is 100 years old today. And that makes him the oldest Major League Baseball (MLB) player alive! He played for (where else?) the Washington Senators from 1950 to 1954. He started playing baseball rather late, making his debut as a pitcher in Cuba when he was 27 years old. 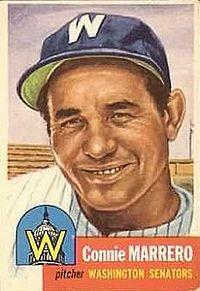 In 1950, when he was a Senators MLB rookie, he was 39 years old! A year later he was selected to play in the 1951 All Star Game. By the time he finished his professional baseball career, he had 367 professional baseball wins (including 97 shut-outs and 39 wins for the Senators) and 197 losses (40 of them with the hapless Senators).